Is Instagram any good for business? I think it’s fair to say that although we post to all these networks, we’d not tried out Instagram. Several members of the team use it themselves, but we’d never set up an account for the business. One reason is that Instagram does not allow outside apps to post directly to Instagram, so you can’t use apps like Buffer to schedule your posts. Also, while a lot of social channels provide you with some analytic data to track how well your posts are doing, Instagram originally didn’t. Personally I’ve never really looked at these (OK, I did look at them just now), but I guess if we were doing the whole social media thing right, we probably should. With the platform maturing, we decide to give it a go and set up an account for the business so that we could answer the question, “Is Instagram any good for business?” We made sure everyone at Love Creative UK had access to the Instagram account. This enables each of us to take control of the account, posts pics and keep an eye out for incoming likes/comments and take appropriate action (or not). Part of Instagram’s success can be nicely summarised by the saying “A Picture is Worth a Thousand Words” – Cliché but true in this case! People love posting and having a nosy at other people’s pictures! With many people’s fast paced lifestyles, they are becoming less interested in reading posts long in text and now prefer scrolling though visual content such as Instagram and Snapchat. Through careful selection of images you can visually tell a story much easier than on many other social media platforms. This suits our website design business well. We can easily share pictures of our latest design work as well as some “behind the scenes” stuff that shows our work process for when we’re designing or developing bespoke websites. We’ve even added an Instagram feed to our website’s home page. So is Instagram any good for business? I’d say the answer is maybe, depending on your business and how you use it. I think what we’ve been doing has worked well so far. We have a slowly growing base of followers and we get a reasonable amount of engagement on Instagram. It’s hard to measure whether what we do on there helps us to get lots (any) billable business at the moment, but there’s certainly no harm in trying. At the very least, it helps people keep track of our latest work, and stops them from forgetting about us. Have you tried it out and found that Instagram is good for your business? 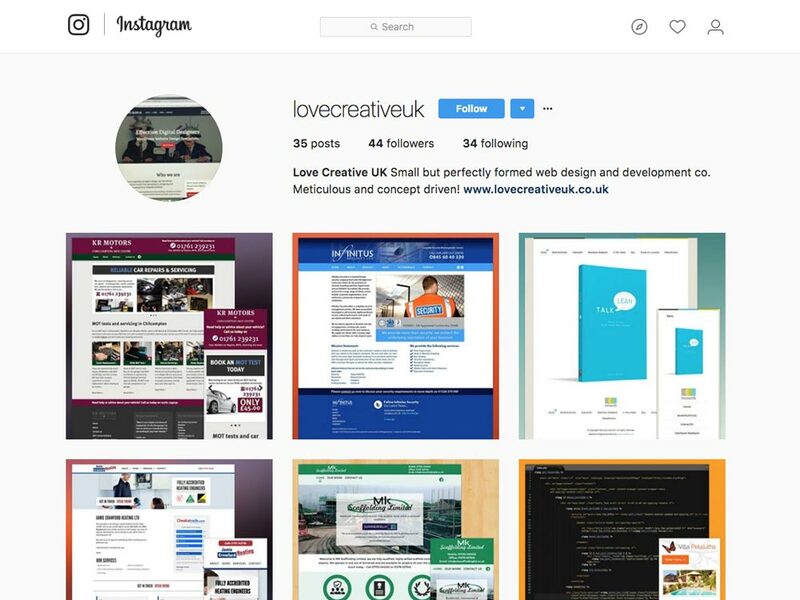 Why not follow Love Creative UK on Instagram to track our story yourself? It would certainly help us to answer “is Instagram any good for business”.